Steps you can take to be a Pro full-time musician! (Don’t quit your job until you read this). What is the minimum required gear to be able to play paid gigs? -Your PA (This is your sound system. It can be an amp that your guitar and microphone plug into or a full-on PA meaning a speaker and a mixing board/sound desk). -A Microphone and Mic Stand (Keep in mind the mic clip (Where the mic rests) comes with the microphone. Make sure the clip screws onto your mic stand. If not, you can use an adapter. -A cable to plug in your guitar (Patch chord/lead cable) and a cable to plug in your microphone (XLR). Many music stores offer great financing options which can be very helpful for buying gear. This is a great way to use your savings to increase your purchasing power. Its easy to get carried away in music stores though so a word of warning. Try not to overextend yourself. My advice, if you’re on a tight budget at first, is to keep it to the basics. Do you really need 9 different effects pedals for your first solo acoustic gig? Probably not. Now gear is a super personal thing. There’s many ways to achieve great sounding live tones. I recommend going to music stores and trying things out. Chat with the people who work there. Going and watching live shows in venues near you is another great way to find gear you like. I often have people ask me gear question at my shows and am happy to assist people when I can. One key thing to remember is that you get what you pay for, gear wise. You can totally buy a setup using a $250.00 guitar, played through a $150.00 speaker but that probably won’t sound very good. Investing in something a little better will give you great sound (as opposed to being a liability). As live performers our reputation can be made or broken by our sound quality. Here’s a rough guideline on how to find great gear, which is also affordable. -Guitars: Odds are you already have a guitar. Your guitar may not be right for gigging though. If you do need to buy a guitar for playing shows, then there’s a few things to keep in mind. I highly recommend having an acoustic guitar for gigging instead of an electric. Make sure it is an acoustic that plugs in (a hybrid, acoustic-electric), otherwise, you’ll need some sort of pickup which you can buy in music shops. This will allow you to amplify your acoustic guitar if it doesn’t have built in pickups. I also recommend a guitar with a cutaway so you can get up there and rip solos at the higher frets. You’ll really have to play a ton of guitars to find one that feels right in your hands and sounds great to your ears. I’m partial to Martin acoustic guitars, personally. My DCPA4 Performing Artist Series Dreadnought just laid itself down so nicely in my arms and felt right at home. It sounded great too. At roughly $1,500.00 it wasn’t cheap but there’s a lot of value in having top notch gear. As well as Martins, I think Taylor also makes very good guitars. You can get away with spending anywhere between $800.00-1,500.00 and get a fairly decent to an excellent guitar for gigging. -PA/Speaker/Amp: If you don’t have a way to amplify your plug-in acoustic then no one will be able to hear it. You also need a way to plug in your microphone. There are a multitude of options available. From Yorkville, in Canada, to Cubes, to Bose, which are everywhere, your music store will have something for you. The first speaker I ever gigged with was a huge Fender combo amp that I could plug my guitar and mic into. This amp had separate volume controls, EQs, and effects for both my vox and guitar channels. My friend Mark lent it to me to get started out and after a while it stopped working (It was really old and needed a part replaced). I decided I would buy a PA next. I bought a Soundcraft 8-Channel Mixing Board and a Yorkville NX55P 550 Watt, 12- inch, active speaker. The debate about which is better between active VS passive speaker rages on. I like traits of both but decided I’d give this setup a go. Again, do the research and find out which you think will fill your needs better. This setup gave me more than enough power for any room I played as a solo act. It was also beefy enough for band gigs in smaller to mid sized venues. To play larger rooms I would have bought another of the same speaker, a sub-woofer, and a wedge monitor for the band to hear ourselves. At that point, a lot of bigger venues have their own PA setup so it was never really a concern. This PA cost me $1,000.00, with my mixer (which I bought new) costing me $550.00 and my speaker (which I bought used) running me $450.00.I continued using this setup for band gigs and bigger solo shows but my next purchase was my favorite yet. About a year before I moved to Edinburgh I wanted to simplify my setup and purchased a Fishman Loudbox Mini. I can’t say enough good things about this amp. It packs 60 Watts of very efficient power into an easy to carry speaker in which I can plug in my mic and guitar with separate controls, EQs, and some effects (Reverb and Chorus). 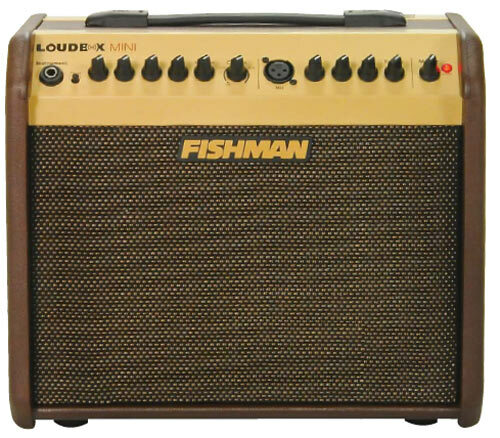 Instead of setting up a PA at every show I would just plug into my Fishman speaker and play. The tone is fantastic also. I spent about $400.00 on mine and it has been serving me well ever since. There are 3 fishman amps that make up this series of amps. There’s the Loudbox Mini which I own (LBX 500 – 60 Watts), a mid sized version (LBX 600-120 Watts), and a quite powerful model at the top of the scale (LBX 700-180 Watts). The Loudbox Mini is loud enough for 95% of my gigs, however in the future I may purchase one of the other, bigger models. 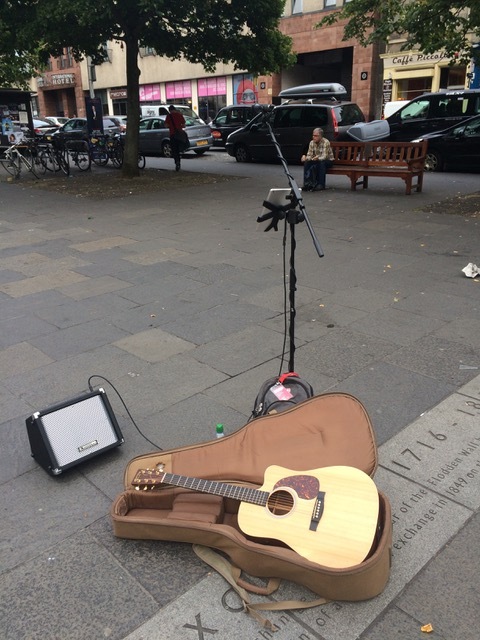 When I moved to Edinburgh I brought my Loudbox Mini (Which requires a power source) and I left my PA at home. There were a couple instances, in large rowdy rooms, where I wish I had more power, but that was very rare. Try out different things. Chat with other musicians. You will have to look at what works best for you but for $400.00-800.00 you can have a banging sound system with great tone that makes you sound super pro and super enjoyable. -Microphone and mic stand: I’ll sound repetitive here, I know, but make sure to do research and try out different microphones. You will want a good dynamic mic for your vocals. In your search you may come across the Shure SM-58, the Senheiser E835, the AKG D5, and the Audix OM2. Each of these mics would do the job for someone looking to sing live on stage. The SM-58 is the industry standard, with it’s durability and great tone (especially for rock vocals). Each of these microphones cost roughly $100.00. On top of that you will need a mic stand which costs anywhere from $20.00 to over $100.00. You don’t need a super expensive mic stand but I would aim for one in the $30.00-50.00 range. Sometimes the more expensive ones go on sale and you can find something good at that price range. Another option, the option I opted for, comes as a kit that includes both a microphone and the mic stand. The Seinheiser E-Pack comes with the E-835 Senheiser microphone which I mentioned above. This is actually my favorite of the pack. I’ve had mine for over 6 years and it is still going strong. I’ve used it night in and night out, on two continents, and it never lets me down. I like the SM58 but I find the E835 to have a lot more presence. I tested the two mics side-by-side though the same PA and noticed the difference immediately. The Senheiser E-Pack is available for $139.99 and has been a beast for me! –Cables/Leads: This one isn’t very complicated. You’ll need patch chords to plug in your guitar and an XLR to plug in your microphone. Make sure to get cables that are long enough. It would be super awkward (and hilarious) to watch someone try to set a mic up on a mic stand and use a 6-foot lead cable into the mixer. Give yourself a few extra feet/metres for comfort and practicality. The cheapest patch chords are pretty cheaply made so I usually go up a level or two. You can also spend a lot on very well insulated cables but to start out there is honestly no need for that. For $15.00-$25.00 each you can pick up a half-way decent XRL and guitar patch chord. I always have an extra of each in my bag in case I play with someone, forget one, or for when one stops working (which is a discovery always made at the most inopportune time). Let’s add that all up and gain a bit of perspective on the start-up costs for the equipment to perform paid gigs. The Grand Total: $1,739.99 (Give or take, remember, if you want to be a pro, you want to sound good!). For roughly $1,739.99 CAD (£997.00 or $1,289.00 USD) you could have the setup I’ve been using for the past 3 years. For the first of those years I was living in Toronto, Canada and driving to all of my gigs. For the other 2 years I have been living in Edinburgh, Scotland and I walk/take the bus to all of my shows. This setup is portable enough that I can lug it anywhere with me. (Pic of me carrying everything, here in Scotland). This setup is just a guideline as I mentioned. Find what you think works well for you but remember, there’s merit in spending a bit extra to have an amazing setup if you can manage it! Once you have all of your gear then you can set it up and figure out how to get the best sound out of it possible. At this point you’re ready to start thinking about what songs to play at your shows. 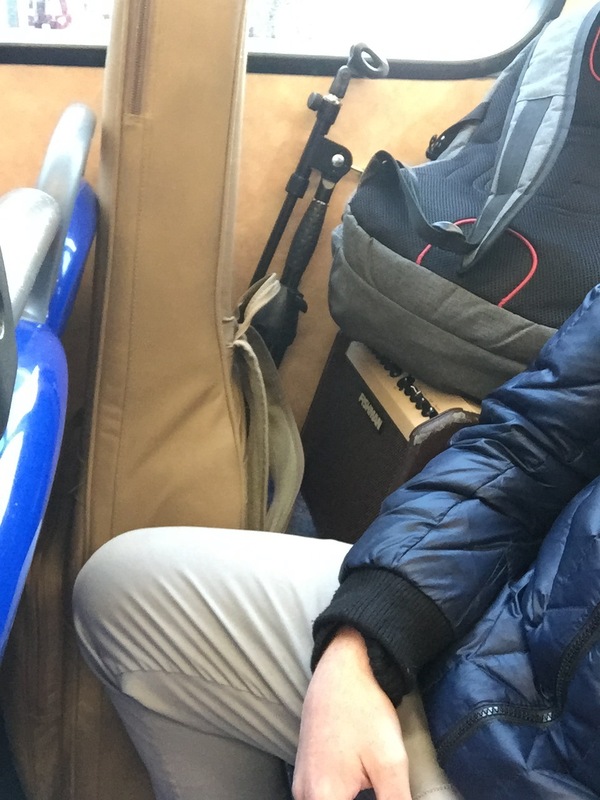 (This is me on the bus in Edinburgh, heading to a gig with all of my gear as mentioned above. I gig multiple times a week with this setup. It sounds great, it is portable, and has been the backbone of my life as a pro performer!). If this was helpful to you then please share this for others to read! IF you have any questions/comments/anything to add then hit up the “Community Page” of the TME website menu and please feel free to leave your comments. Cheers. Testing this out, hope this website has been helping you out!